There are 11 reviews of Oud for Love . I blind bought it after reading lyrical odes to oud for love on basenotes, and also recommendations by forum members, and I'm glad I did! It definitely has an oud note which is tame but entirely noticeable and very pleasant. It has a boozy opening that smells more like tequila than whisky as a friend of mine noticed. Deserves all the praise that it gets. Perfectly unisex and highly recommended. My initial impression was something rich and smoky, tarry, almost like cade oil. But with a heavy animalic aspect, leathery, with maybe a hint of licorice. Perfect for when I don my leathers and mosey down to the bikers club to meet my fellow greasers for a ton-up ride. 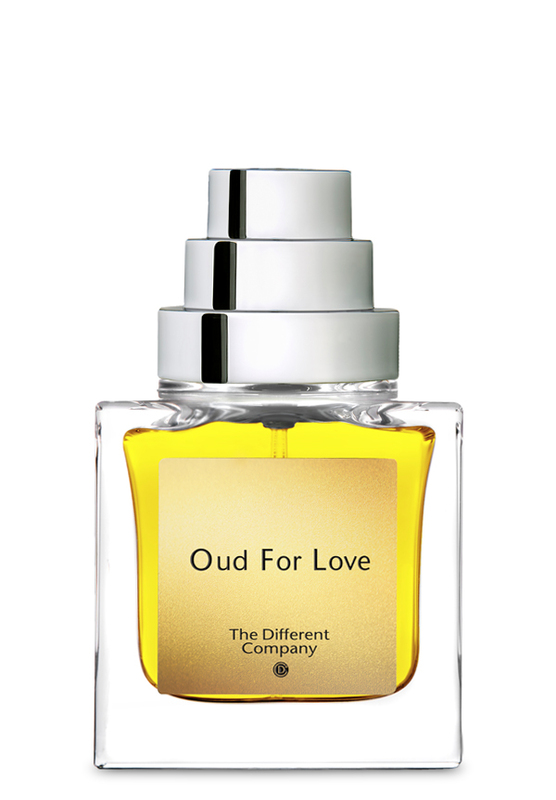 Oud for Love is supposedly the feminine counterpart to The Different Company’s Oud Shamash, which I also love, but to my nose, both of these fragrances are completely unisex. Oud for Love is as beautiful as Oud Shamash, if that’s possible, but takes the (supposedly real, Laotian) oud note in a different, more gourmand direction than the smoke and woods of Oud Shamash. Here, the sour oud oil note is wrapped up in a gentle wheaten note, a hot breath of bread or cake coming from a baker’s oven. The cumin, saffron, heliotrope, and whiskey notes are probably what conspire to create this impression, a thread of sweet grains or powdered malt linking them all. There is spice, too, in the heart, and an earthy, creamy ylang note. But the lingering impression is of gently caramelized, milky, breadiness that buffets the medicinal twang of the oud to perfection, bringing to mind long ancient wooden tables spread with sweetmeats, honey, and freshly-baked bread in drafty banquet halls in medieval castles. Still, the balance tilts more towards woods than food, and it is only very subtly sweet, in the way that bread and milk and whiskey are contain a natural, round sweetness of their own. Highly recommended to people who find most oud compositions to be too harsh, sour, or medicinal – this is an oud that’s been breastfed and wrapped up in a cashmere shawl. One could look at the roster of listed notes – and yes, there are rather a lot of them – and try to place them in their order of prominence and appearance but that would be a fruitless task, capturing little of the mature and balanced nature of this perfume. It is nothing but elegant. Its centre of gravity is a deep green chord (at once herbal and somewhat medicinal in the vein of eucalyptus) married with an oud construct which seems to be a combination of a smoky wood note (like cypriol) and vetiver. (Here there is a faint echo of Ormonde Man which works magic with a similar marriage.) Behind this lurk malty and sweet flavours, a touch of vintage booze, a crumb of toffee, and spices to give just a hint of carnality and plenty of warmth. But the whole panoply of effects is blending harmoniously to provide an overall deeply satisfying rich woody experience. This seems to be living wood, breathing with the wearer’s breath, sending generative green shoots out in the early stages, yet carrying the ancient memory of its years in its olfactory pleasures. Oud for Love is completely present but never excessively so, a quality that Duchaufour has said in interviews he aims for in his compositions (but doesn’t always achieve). Aldehydes, Angelica, Coriander, Caraway, Saffron, Whiskey. Cloves, Iris, Sandalwood, Tuberose, Ylang Ylang. Agarwood, Amber, Castoreum, Caramel, Immortelle, Heliotrope, Musk, Tolu Balsam, Vetiver. Bertrand Duchaufour's resume is.......let's just say impressive. The lists of his creations are too numerous to mention and when I recall his contributions, I think of transparency, well executed and memorable. Collection Excessive's Oud for Love is yet another worthy interpretation of the oud genre, courtesy of Bertrand. This man has skills and the uncanny ability to take an idea, shape it mentally and then manifest it in a liquid delivery system in order for you and I to not only to "see" it,but to experience it as well. I've found some similarities in Oud for Love and Ameer Al Oudh. Their themes are related and Bertrands version is airborne and clear, whereas the Lattafa is weightier and perhaps slightly less versatile because of this. I happen to like both, but Oud for Love is the more luxurious and elegant of the two after numerous comparisons. For a surety, this release is easily worn by either gender. Much of Duchaufour's work, over the years, has resulted in a final product with sheerness. Oud for Love continues this technique of substantial, yet breathable. I purchased a bottle of Oud for Love in order to experience full wearings. In truth, I like it more each wearing. There's much going on in this aroma, yet it does so without yelling. The tuning of notes is the magic here. It's the difference between a guitar riff being played legato instead of staccato. Effortless and fluid from initial spray to comfortable drydown. The use of clove here is actually masterful. Playing off other spice qualities and Tuberose, I experience a mild herbaceousness because of it. The other players, who I normally attempt to identify and extol, one way or the other, are present and accounted for, but so well orchestrated that you simply need to sample this and decide for yourself. I cannot help but recommend this if you're looking to try an elegant oud that won't make you choose between it and paying your rent. I have absolutely no regrets for purchasing Oud for Love and because of it, I am seriously considering a bottle of Oud Shamash as well. The Different Company's Oud for Love genuinely sits in the middle of the gender line to my sensibilities. It's versatile, uplifting, elegant and does not bog you down like some ouds have a habit of. It has a rather high price point, yet can be found online for slightly under $2 per ml. That's what I paid for mine and to me, it was worth it. Sillage is polite as you would expect, but still smells full in your personal space. Longevity is yet another deceiving attribute. You can detect this the next morning rather easily, but during the wearings, expect 5 hours. Thumbs up from SS for Oud for Love by The Different Company. As always, a sample wear is highly recommended. Thoughts on Oud for Love by The Different Company?